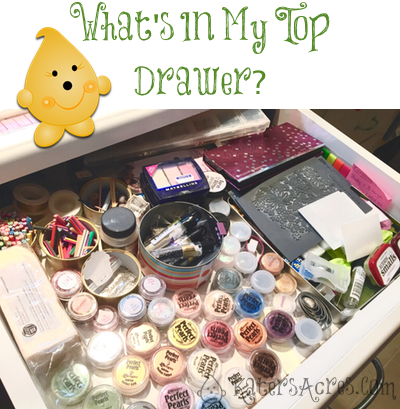 Home / Polymer Clay / Hints, Tips, & Tricks / What’s in My Top Drawer? What’s in My Top Drawer? One of my favorite posts that other artists do is a glimpse into their studio. I love to see their workspaces, how they create, and even the tools they use. While this post will NOT be exhaustive by any stretch of the imagination, it will definitely give you some great insight into my daily grind in my polymer clay studio. First off, I should explain my top drawer. My top drawer (the front at least) contains some of the things that I use and reach for almost constantly while I work. My counter is at standing height and I often work standing up. If I were to sit, this drawer would be difficult to open as it’s right in front of me. But, since I work standing, this isn’t an issue. Here’s a few of my “go to” supplies (for tools see my SPINNER post) in my polymer clay studio. Perfect Pearls – Oh my heavens, I just love these. I keep ALL of the colors I have right in front of me because I use them so often. Christi Friesen’s Glitter Balms & Surface FX – I have a whole article for Christi’s Glitter Balms, I simply love them. Read the article for more information. I do not believe that the Glitter Balms are available for purchase anymore, but if you still have them, you know they rock. Surface FX are still available on Christi’s website. A One Pound Bar of Premo! Translucent Polymer Clay – Let’s be honest … I use this so fast, it helps to keep this pounder readily available so I can just cut a chunk off, condition, and use! An upcycled can holding different seed beads (still in their containers). I use black matte & shiny beads in 6-0, 8-0, and E-Beads. I can NOT run out. So I almost always have a surplus. Oval Cutters – Oval cutters are one of those things that are not rated near high enough in my opinion. I use these constantly. This set is from Polyform Products. You can get yours here. Rubber Stamps from Lisa Pavelka & Christi Friesen – See the article here. That little altoids container?! OH! Well it’s not altoids, but it is some german vintage glass stones from B’Sue Boutiques. You can see a picture and mini-review here. Old Makeup – Yep, the makeup junkie in me (even though I hardly wear any) keeps palettes, singles, etc to use on my designs. Why? Because even though it’s old and dated, I just can’t throw it away! Millefiori Sticks – I believe these were intended for use on nails, but I use them randomly on a variety of things. You can get some here. Post-It Notes & Flags – Why? I use them for everything … placing on my work surface to work on, notes for color recipes to be transferred later, ideas, and well … everything you’d normally use a post-it note for I guess. Have you tried any of the items above? Did you like them? Which are YOUR favorites? Leave your thoughts in the comments below.